We made it to Friday, and we didn’t get more than a few drops of rain. Grr. As much as I don’t appreciate the severe weather in the forecast, we could really use a couple inches of rain. And then a couple more in another week or so. And probably a couple more after that. As you can see, our Whole Garden view is getting greener, little by little. It helps that the tomato plants are sitting out getting some sun and wind. I almost over-winded them on Wednesday morning. They were looking a little battered by the time I took brought them back in. The strawberry garden, unfortunately, is the one area that does not seem to be getting greener. Usually bareroot strawberries are pretty easy to grow, so the fact that we have lost about 80% of the plants is not stellar by any means. And it is probably mostly my fault plus the weather. (At home I can blame the rabbits!) 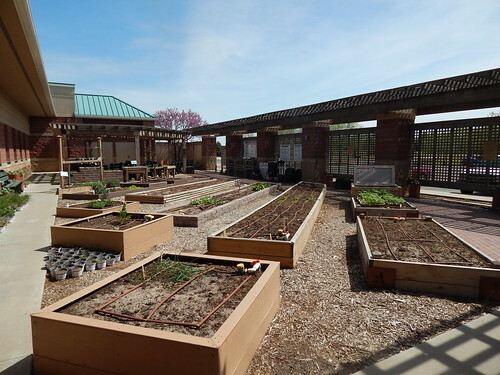 When we planted, the soil was incredibly dry, so we worked really hard to get it moist. Then the temperatures were bouncing around and fairly cold overnight. Then I tended to hit the strawberries with water every time I watered the areas we planted seeds. The top inch of the soil dries out quickly and usually needs to be moistened frequently. 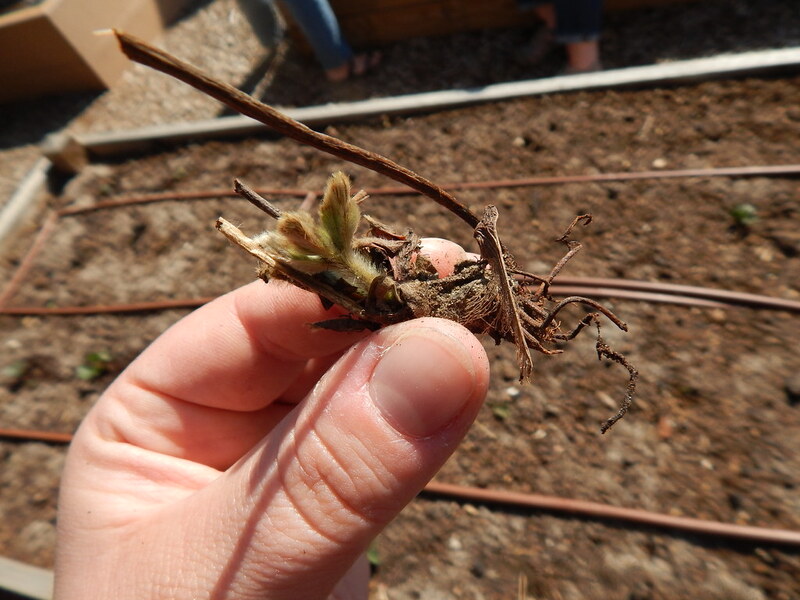 Strawberries with 4-6″ of roots – not so much. And then it was cold. My guess, without sending in a sample for diagnosis, is that the majority of the plants succumbed to a root rot of some sort that thrives in cold, wet soils. So…we may be on to Plan B for the strawberry garden. I don’t even know what that is right now. I’m sure we’ll figure something out! 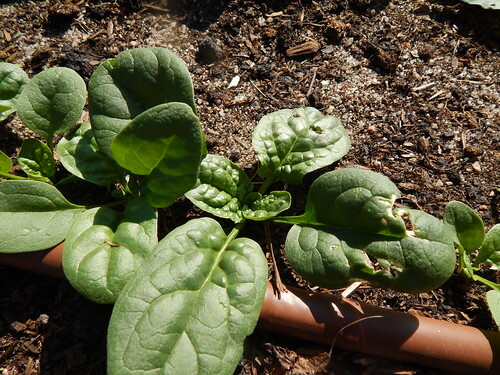 The ‘Bloomsdale’ spinach in the MG Faves garden is looking great! At least it likes the cold weather. And this is the ‘Sagar’ spinach from the Taste of India Garden. It doesn’t look very much like the other spinach, does it? I suspect that it may actually be some type of New Zealand spinach, or at least some significantly different plant that is called spinach in India. This is a good example of why it is a good idea to use (or at least include) the scientific names for plants, especially in a cross-cultural situation. It would be nice to know if it is a different species than we are used to for spinach. 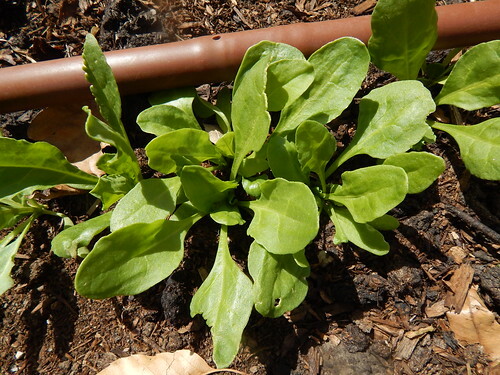 It would also have been nice to know before planting, as a New Zealand spinach has slightly different requirements. We could be lucky that we have such a good germination rate! 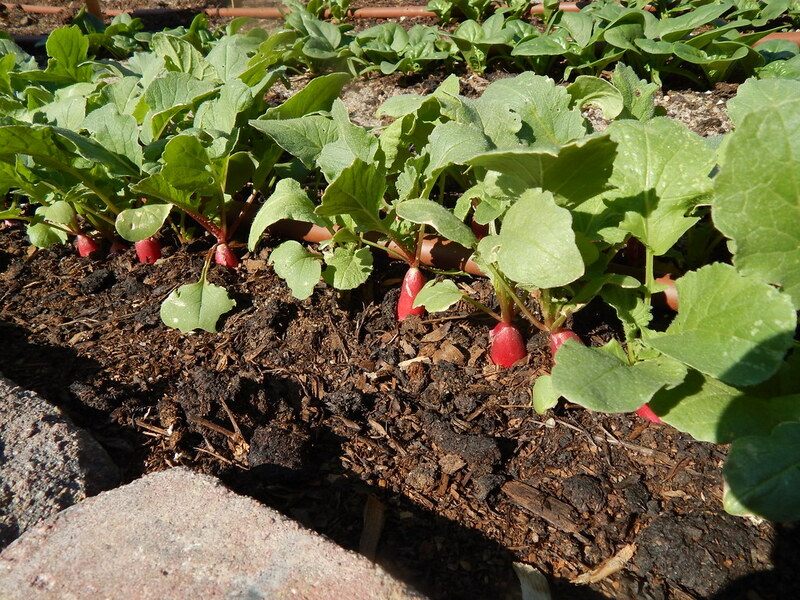 The ‘French Breakfast’ radishes are looking great and growing fast. It is always nice to have something that is growing well to look at! 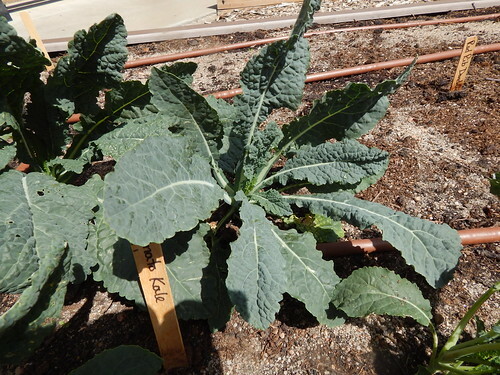 Speaking of growing well, this Lacinato Kale that we transplanted in March is really starting to look nice. Now whether it looks tasty…I guess that might be in the eye of the eater! Posted on April 25, 2014, in PhotoEssays and tagged kale, spinach, strawberries. Bookmark the permalink. 2 Comments. My strawberries are just coming out of dormancy even though I planted them a week before you. I thought they where dead also but in the last few days 3/4ths have leaves. Maybe yours will wake up too. I would hope for that, except that I can find the dead tops and pull them out to see the dead roots.